Drivers at Plastic Express are valued as unique individuals. Plastic Express was founded in 1970 by a truck driver…. Plastic Express – Phoenix, AZ. Look no further, Plastic Express is that team. Drivers at Plastic Express are valued as unique individuals…. Plastic Express was founded in 1970 by a truck driver. 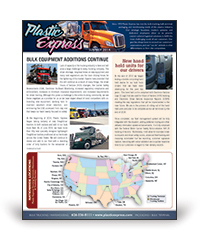 Plastic Express prides itself on our People, Safety, and New Equipment…. Plastic Express – Industry, CA. Look no further, Plastic Express is that team. Drivers at Plastic Express are valued as unique individuals…. At our Packaging and Distribution Centers, Plastic Express utilizes modern inventory handling and packaging systems to meet our customers’ packaging and warehousing needs. We have fully automated palletizers for our bagging lines and super sack filling machines servicing our customers on both coasts. We have a customized software solution to track the individual packaging job and update you on the status of the order. Plastic Express services customers in the United States, Canada and Mexico from our bulk terminals and state-of-the-art packaging facilities strategically located throughout the United States. All our bulk terminals offer high-frequency railroad switching. For on-time delivery and prompt, professional service, count on Plastic Express. To meet your bulk trucking needs, Plastic Express maintains a fleet of over 100 self-loading 1600 cu. ft. and larger J&L bulk trailers and late model Freightliner diesel tractors.